Marble is an attractive surface for many reasons. It’s durable, natural, and elegant in a number of business and household settings. From iconic colonnades to floor tiles, showers and vanities, marble is a stone that has been a building favorite for thousands of years. 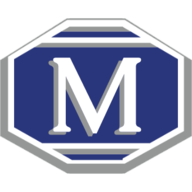 However, thousands of years ago, marble didn’t have to deal with a number of the chemicals and substances that it comes into contact with in modern times. Let’s talk about cosmetics. Probably not a sentence you thought you’d read from a stone care newsletter, right? Well, we’ll try to make this as painless as possible. Women now make up nearly 51% of United States population and roughly 84% of those women, according to research group NPD have worn makeup in the previous year. What does this mean? That makeup touches all of us in a way. These products, while marketed as beauty-enhancing solutions for women, can stain or otherwise damage your stone. Particularly soft porous stones like marble. Since it’s more likely than not you are either a woman or have at least one woman in your life, it’s necessary to understand how to deal with marble stains from cosmetics. 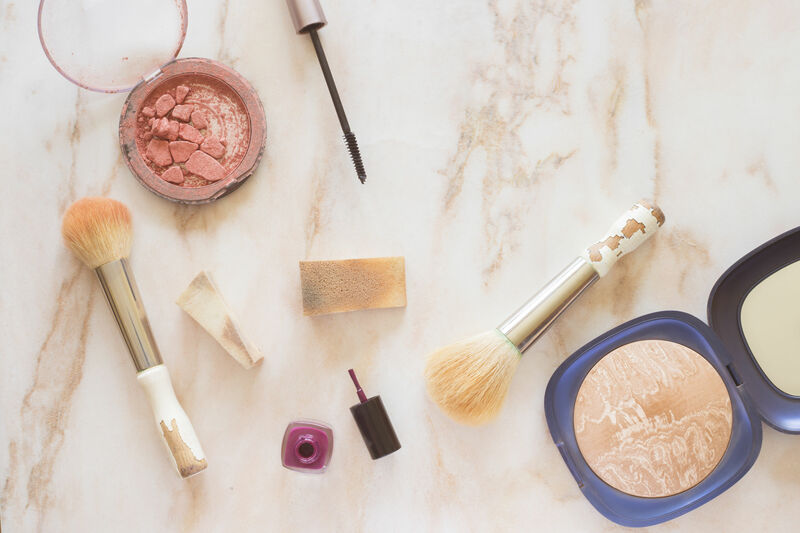 Makeup residue can be grease, powder, or liquid and all have the potential to leave a stain. What you don’t want to do is scrub at the remnants because this could push the stain further into the stone, making it harder (and costlier) to remove. Blot first, but never scrub as this can spread of drive it deeper into your stone. The best solution for dealing with these types of stains is by use of a poultice. If you remember from some of our previous newsletters, a poultice is a mixture of some sort of absorbent material with a solvating agent. This is then left to sit on the stain, where ideally, it will pull the stain from the pores of the stone as it dries. The type of poultice you use depends upon the type of stain you’re dealing with. A mixture of distilled water, talcum powder, acetone. Mix till you get a paste-like consistency and apply to the stain. Cover with plastic wrap and tape in place, cut slits into the plastic to let it dry. Leave for at least 24-hours. Dab with a moist clean cloth (not wet just damp enough to allow dust or powder to stick to the cloth). If color remains afterwards, use a mixture of poultice of 4 cups distilled water, ½ tbs dish soap, 1 tbs white vinegar. Gently dab surface residue with a clean dry cloth. Allow the cloth to absorb the stain. Again, if this does not remove the stain, then you will need a to set up a poultice. Use the poultice recipe for grease stains above. 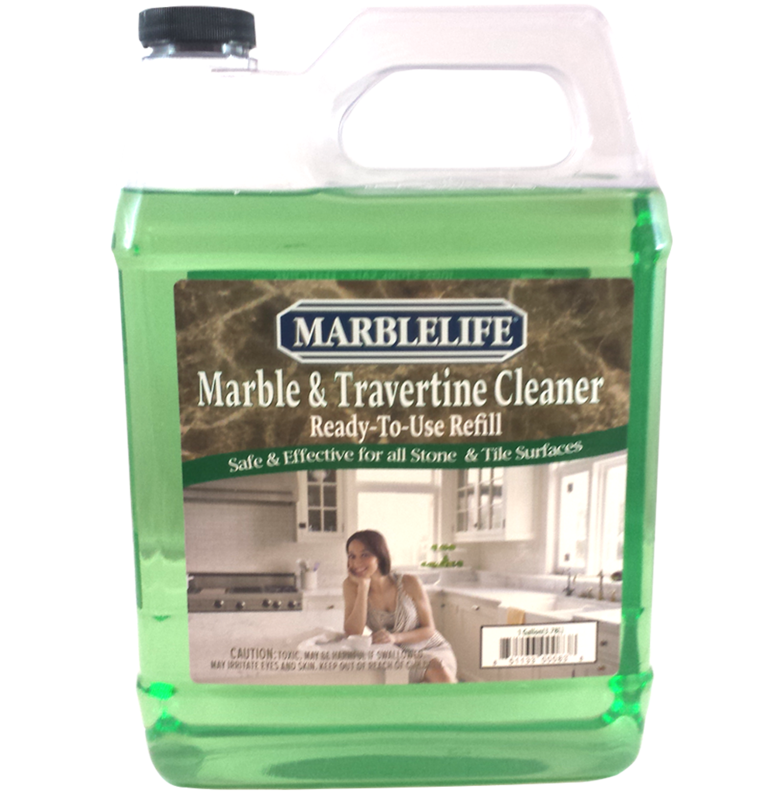 MARBLELIFE® Marble & Travertine Cleaner is an “InterCare” based cleaner and is a safe, easy to use and highly effective way to clean your natural stone surfaces.